Yesterday, my sister and I were invited to a press event at Oona in Berchem, Antwerp. We were able to have a look at the Fall / Winter '10 collections of various brands. It was a very interesting day. We even had our personal guide, a super sweet girl called Marie, who showed us the different collections and gave us a lot of information on the brands, their designers, the fabrics they used ... I think I made notes the entire time, my sister kept joking that I looked like a secretary. I didn't want to write one big post with all of the pictures already in it, because I think it would spoil the surprise a bit. So here is already a little peek. Be sure to come back, I'll be writing different post about the event with lots of pictures! P.S. To see Oona's blog here on Blogspot, click here! I would like to thank Oona (and Marie) for the opportunity. Actually, my sister gets all the credit for this one! 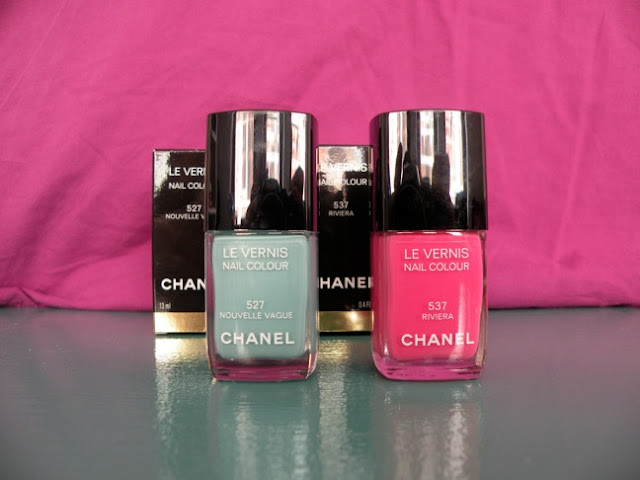 We were so in love with the Chanel Le Vernis nailpolish (The Pop Up Collection), that she decided to pre-order two gorgeous colours, which she picked up today. She did all the effort to get her hands on them - since they're available in selected stores only - so I would like to say: Thank you, sis'! Love you! For the moment, my nails are bubblegum pink, so I wanted to paint my nails with the greenish / blue color. But I also really like the fuschia like color. I really can't decide! What would you do??? P.S. You should really check out the haute couture-post my sister posted on her blog. I'm so jealous I wasn't there! She discovered the haute couture exhibit by accident, while she was on a weekend with her boyfriend... Amazing pictures! I was reading the Dutch Grazia, when I saw this editiorial I liked and I wanted to share it with you. I love the way the outfits are combined, seeing already a couple of things I would like to have, like the necklace with the big stars, for example. 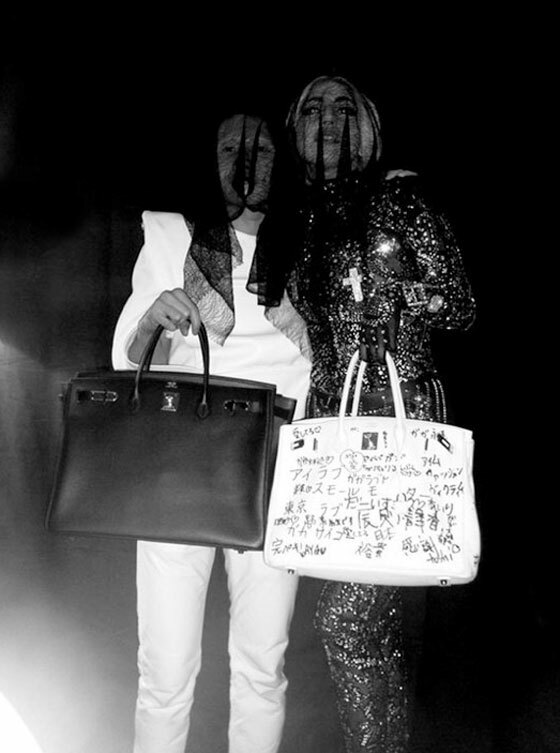 If fashion lovers were mad that Lady Gaga wrote a small message on her white Birkin-bag, they'll probably go ballistic now! In a previous post, you can see that Lady Gaga had a message for her Japanese fans when she arrived in Tokyo. A lot of girls weren't happy that she wrote that message on her Birkin-bag, due to the long waiting list and price tag of the bag. My sister shared a link on my Facebook-wall, showing pictures of Terence Koh - who is a Canadian artist with Chinese roots - writing all over Gaga's Birkin-bag. Maybe it's just me, but I actually like the way Gaga's Birkin looks. It has something special - not that I would ever write on my Birkin-bag, should I ever own one. I was very excited when I saw this editorial published in the April issue of Elle Espana. 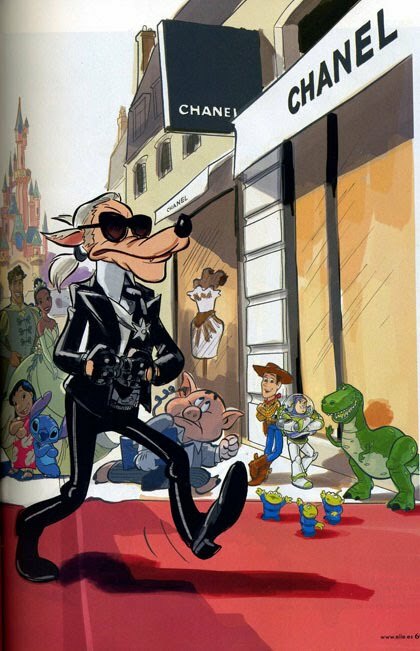 Even though I'm 20 years old right now, I'm still a big Disney-fan - especially of the old movies. I've been to Disneyland about 9 times and I would go back in a heartbeat! I still remember buying a Snow White-dress, pink princess slippers, a Cinderella wand, a velvet pink Minnie Mouse diary, having breakfast with all of the Disney characters ... My parents spent fortunes there, just to keep me satisfied. The editorial shows famous Disney-characters as famous fashion designers such as Karl Lagerfeld, John Galliano and Donatella Versace. One of my best friends shared a link on my Facebook to an article about Lady Gaga. Apparently, Lady Gaga is in Tokyo and when she arrived there, she had a message for her fans in a special way. "I love little monsters. Tokyo love." Apparently, a lot of women are mad at Lady Gaga, due to the long waiting lists and the fact that the Birkin-bag costs a fortune. I'm not really mad at her, since it is her Birkin-bag and she can do with it what ever she wants. Two days ago, I went to Antwerp with my mom and sister. Starbucks opened there a while ago, and I just had to have a frappuccino chocolate with whipped cream! I was ready to pay when I noticed I left my wallet at home - which is an hour drive from Antwerp. Thank God my mom was right beside me, so she could pay for me. We went to eat at the Wok Away, one of my favourite places to have lunch when I'm in Antwerp. Now that I think about it, we always go there. I would recommend the wok combination with chicken, rice and a sushi set, which you can see on the first picture. (I already ate some sushi when I took the pictures - there were more sushi pieces when I got the plate. Oops.) I'm getting hungry already! I wanted to look for the 'red roses-jacket' (or dress) from the Garden-collection of H&M. I found the jacket, but when I tried it on, I noticed that it wasn't made for me. It looks so great on other people, so I was a little bit bummed that I looked horrible on me. I was looking around, when I noticed this black velvet bolero with golden decorations on it... and immediately fell in love with it and forgot about the roses-jacket. My mom bought it for me... Thanks mom, I love you! A good friend of mine is getting married, so of course, I had to dress up. I saw this dress here in Maasmechelen for the first time, but it didn't fit me well. A couple of weeks later, I went to Antwerp, and I entered a small store I usually never ever enter... And I saw the same dress hanging there! I decided to try on the same size as I did here in Maasmechelen, and guess what... It fitted perfectly! I still don't know how that's possible. It's not really visible in the picture, but the dress leaves one shoulder open and has a big bow on the other side. It's freezing outside, I hope I don't get sick! I don't have much time, my dad is picking me up in half an hour.